Acne is usually a temporary problem, but acne scars can be permanent. However unwelcome they may be, scars are part of the skin's normal healing process after it has been damaged by a wound or injury. Most superficial wounds heal without scarring. It's when the dermis is damaged that scars form on the skin. Learn what causes acne scars and how you can prevent them. Acne scars are most often the product of an inflamed lesion, such as a papule, pustule, or cyst. Inflamed blemishes occur when the follicle, or pore, becomes engorged with excess oil, dead skin cells, and bacteria. The pore swells, causing a break in the follicle wall. If the rupture occurs near the skin's surface, the lesion is usually minor and heals quickly. More serious lesions arise when there is a deep break in the follicle wall. The infected material spills out into the dermis and destroys healthy skin tissue. To repair the damage done to the dermis, the skin forms new collagen fibers. Collagen is the fibrous protein that gives the skin its strength and flexibility. Unfortunately, the finished "repair job" never looks as smooth and flawless as before the injury. Inflammation is the single greatest gauge of scar development. The greater the inflammation on the skin, the more likely scarring is to occur. Deep breakouts that take a long time to heal also increase the chance of scarring. Blackheads, whiteheads, and other non-inflamed blemishes typically don't cause scarring because these types of lesions don't injure skin tissue. More commonly, acne causes atrophic or depressed scars. Atrophic scars develop when there is a loss of tissue. Ice pick and boxcar scars are two examples of atrophic scars. Often, what is taken to be an acne scar is not a true scar at all, but rather post-inflammatory hyperpigmentation (PIH). This temporary discoloration of the skin will eventually fade on its own. Certain treatment medications, such as Retin-A, may speed the fading time. Treat Acne as Soon as It Develops: The best thing you can do is get acne under control as soon as possible. Begin treating it right away, and see your doctor immediately if your acne isn't getting any better with over-the-counter acne treatments. Quick treatment helps to keep breakouts to a minimum and prevents acne from developing into a more severe form. Prevent pimples and you'll prevent scarring. Reduce Inflammation: Large, inflamed acne blemishes are much more likely to leave scars behind than non-inflamed breakouts and blackheads. Your goal should always be to calm inflammation and avoid doing anything that will further irritate your skin. Aggressive scrubbing and harsh skin care products should be avoided. Don't Pick at Scabs: Picking at scabs should also be avoided. A scab is the skin's natural "bandage" which protects the wound as it heals. Picking a scab off a wound before it is ready prolongs the healing process and increases chances of scarring. Know If You Are Prone to Scarring: The reality is some people are more prone to scarring while others come through a case of severe acne without a scar in sight. If you are highly prone to scarring, see a dermatologist right away to discuss acne treatment options. 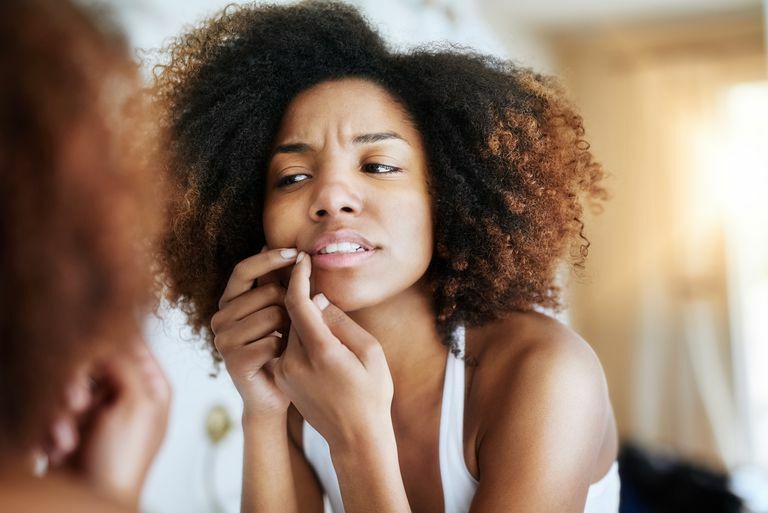 See Your Doctor If You Get Large, Deep Breakouts or Acne Cysts: While smaller blemishes can still scar the skin, it's the big guys that usually do the damage. Because they extend deeper into the skin, deep nodular breakouts or cystic breakouts are more likely to destroy skin tissue and leave scars. Over-the-counter acne products just won't help these types of breakouts. Get an appointment with a dermatologist. Quick, effective treatment can help lessen the chance of developing deep scars. You may still develop some scarring even after your best efforts. Luckily, there are scar treatments to help minimize the appearance of scarring. Don't hesitate to talk to your doctor. He or she can explain the treatment options available to you. Acne Scars: Who Gets and Causes. American Academy of Dermatology. Fife D. "Evaluation of Acne Scars: How to Assess Them and What to Tell the Patient." Dermatologic Clinics. 2016 April; 34(2):207-213. Werschler WP, Few JW, Jacob CI, et. al. "Advancing the Care fo Post-Acne Scarring: Expert Insights Into New Treatment Options." Journal of Drugs in Dermatology. 2016 May; 15(5):518-525. How Can You Prevent Scars Caused by Acne? Will Olive Oil Heal Your Acne Scars? Will Those Dark Spots Pimples Leave Behind Ever Go Away?